Interested in becoming a nurse? Here's information on nursing education and experience requirements, where to find job listings, and tips for acing an interview. There are many different types of nurses, but most fall into the categories of LPN, RN, or NP. Licensed Practitioner Nurses (LPNs), in some states called Licensed Vocational Nurses (LVNs), do basic patient care under the supervision of doctors or more highly trained nurses. They can enter the field simply by taking a short training program and passing a test. Some find that an associate degree provides more career flexibility for the same certification. While the certification itself is national, state requirements for practice vary, so make sure your training program is approved by the state where you wish to work. Nurse Practitioners (NPs) can do much of the work doctors normally do, though state law varies. To become an NP, first become an RN, then complete a graduate program, a required number of clinical hours, and an additional test. Additional, more focused training may also be required. Some NPs earn doctorates, especially if they want to get into administrative work. Registered Nurses (RNs) have more responsibility and make more money than LPNs. To become an RN, complete an associate or bachelor’s degree program, and complete a national test. Some states may require additional steps for state licensure. Periodic re-testing is also required. A master’s degree opens up further career options. Registered nurses must complete coursework in nursing, anatomy, physiology, psychology, biology, microbiology, and chemistry as part of a bachelor's degree, associate's degree, or hospital-based diploma program. In order to be licensed, registered nurses must pass the National Council Licensure Examination after completing a state-approved academic program. Registered nurses must have sufficient scientific aptitude to master the required science coursework and learn the medical concepts which form the foundation of nursing. They need to have the capacity to remember scientific, pharmaceutical, and medical terminology. 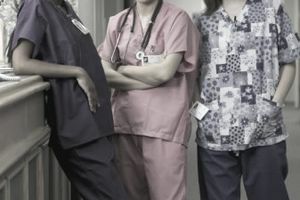 Registered nurses need to have a caring and empathic nature to connect with patients and provide the support critical to their recovery. They must be able to do so while maintaining sufficient emotional distance to avoid internalizing patient problems. Patience is required to deal with patients who react to their illness with strong emotions or need to have information repeated many times. Registered nurses must have strong communications skills to convey complex information in simple terms to patients and to interact effectively with other hospital staff. Problem-solving and critical thinking skills are needed to interpret emerging information about the health status of patients. Registered nurses must be well organized and detail-oriented to keep track of multiple patients. In order to gain admission to nursing programs, you will need to demonstrate that you are comfortable interacting with sick or injured people. Volunteer at a local hospital or nursing home while you are in high school, if possible. Working as a paramedic or getting certified as a nurse's aide are other ways for you to gain clinical experience. Here's a nursing career overview. Also review a list of nursing skills for resumes, cover letters, and job applications. Tap specialized nursing job sites. The easiest way to find sites with job listings for nurses is to search Google for "nurse job sites." Also, search job sites which have listings from many different online sources like Indeed.com and Simplyhired.com using keywords such "nurse," "RN," and "Registered Nurse," and the location where you would like to work to generate more job leads. Ask your college career office about Nursing Career Days at your school or in the surrounding area and plan to attend if possible. Inquire about alumni contacts in nursing and healthcare. Contact these individuals for advice and perspective on your job search and career. These informational interviews can often lead to referrals for jobs. Contact former employers, clinical supervisors, faculty, family, and friends to get other referrals for informational consultations. Join Nursing Associations and attend conferences and workshops to meet with other nursing professionals. Volunteer to help organize meetings to gain even greater exposure to fellow members. Ask faculty for recommendations about the best organizations. If you are looking for temporary or per diem positions, consider using a staffing agency like nursefinders.com. If you've been out of the workforce for a while, here are tips for how to return to nursing after a career break. Nursing candidates must prove to interviewers that they have the right set of clinical skills and personal qualities to handle demanding nursing positions. Be prepared to reference a list of your clinical skills and provide examples of situations where you applied those skills. You will be asked about challenges you have met and problems which you have solved in patient care contexts. Be ready to share specific patient scenarios where you intervened with difficult cases and individuals to help generate positive outcomes. Nurses must be effective team members and get along with challenging personalities. Be prepared to share examples of how you have dealt with difficult colleagues. In addition, you will need to convince employers that you are aware of your weaknesses and are prepared to take steps to improve your performance. An effective approach can be to mention historical weaknesses and steps you have taken to address those areas. Practice responding to typical nursing interview questions with faculty, advisors, family, friends, or career office staff. Send a thank you letter immediately after your interview and convey your high level of interest in the job, why that position and healthcare organization are an excellent fit, and your gratitude for the opportunity. Address any issues about your candidacy which may have surfaced in the interview in a positive manner, if possible.